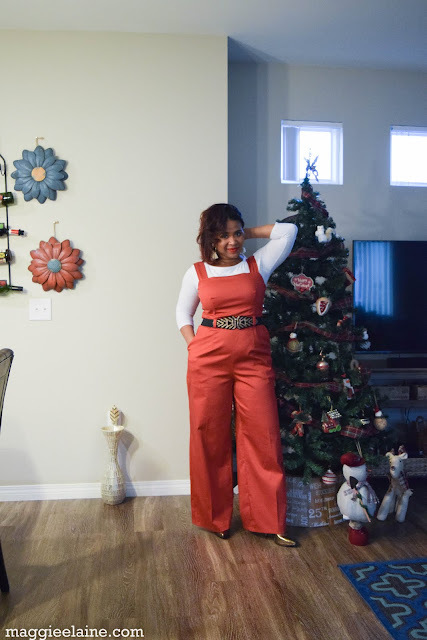 Today I would like to share with you the jumpsuit that I made using a lovely paprika cotton lycra stretch woven from Fabric Mart. 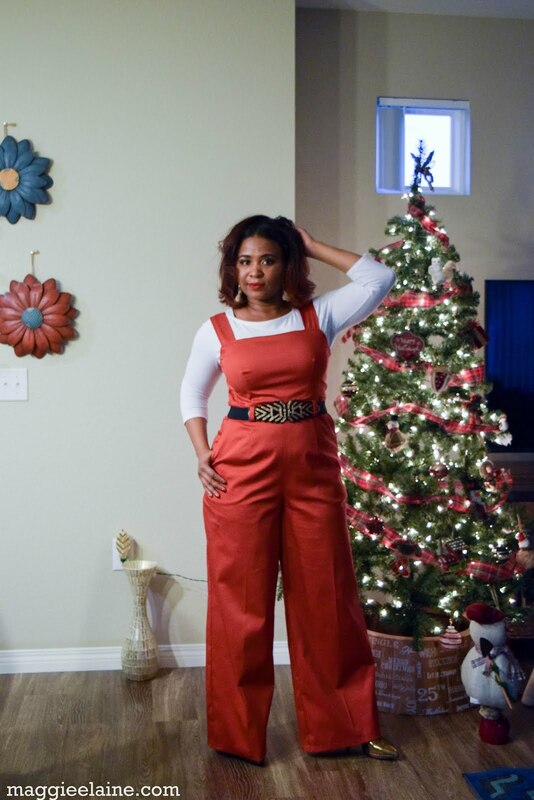 I used McCall's M7626 View D to make this garment. I think it is a lovely edition to my wardrobe and it is something that I can wear year round, by wearing it with various shirts with different sleeve lengths, going sleeveless, or wearing this with no shirt at all as pictured on the cover of the sewing pattern. Since it is our winter in Vegas, I opted to style this with a quarter length sleeved knit shirt. I also tried this look on with thinner, non-bulky button down shirts and it still looked great with those too. I didn't notice until I had already done a lot of work to attach the bodice lining and the straps in the back that View D does not feature the buckled straps. I would have preferred to add the buckles, but the straps that I cut for View D were too short to add the buckles after the fact. For the lining I used a neutral tricot that I had in my stash. I made sure to choose a lining with stretch so that it would stretch with the stretch woven fabric. I love the pockets on the sides of the pants. The width of the pants are wide. I slimmed mine down a tad bit. Since I am 5'1.5", they swallowed my legs a little too much (and I was sort of tripping on the pants) with the width. If I were to make these again, I would add a little bit more length. 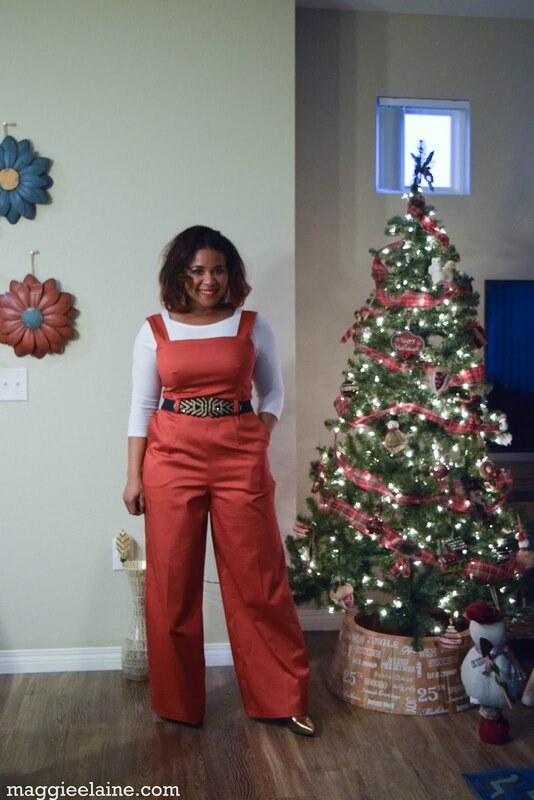 Although I am short, I love to wear tall heels and I like for wide leg or boot cut pants to skim the ground. Actually, I preferred the length of these pants "pre-hem". I believe the pattern says to hem these at 1.25 inches; however, I hemmed it at 1 inch and wore "shorter" heels. View D is not featured with belt loops, but I thought it would be a great addition so I added them. I tried on many belts for this jumpsuit , but thought I would go with a festive belt for the holidays. 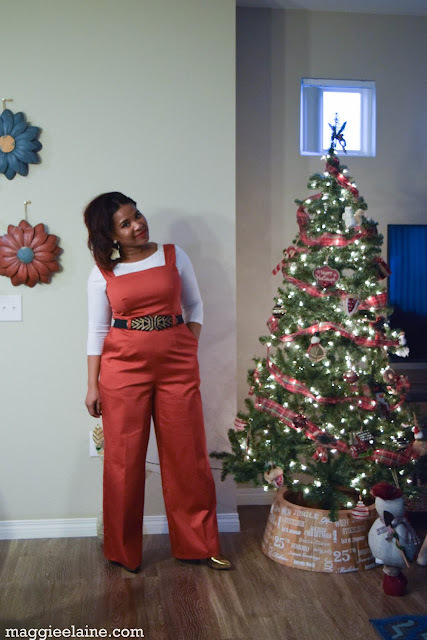 This garment was fairly easy to make and I would consider making this again in the future. I think the fabric choice is perfect, because the stretch in the fabric provides for a good fit while still allowing me to breathe, move, and sit comfortably. That's all I have, but I want to wish you a very Happy and Prosperous New Year!!! See ya later 2017! I am looking forward to 2018!!! 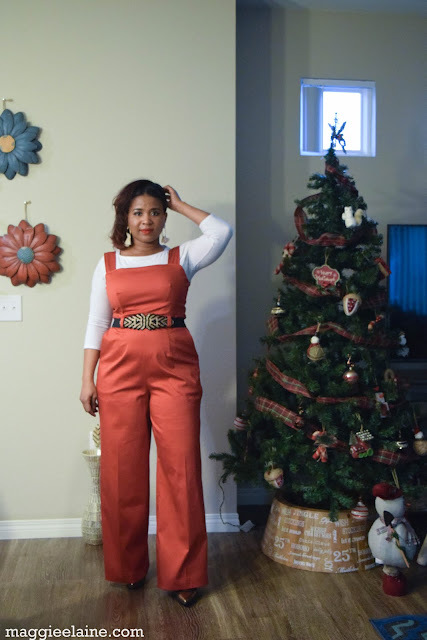 I love the jumpsuit and color of the fabric. Thank you for sharing! Thank you, it's such a wonderful color and great fabric to work with. You did a fantastic job with fabric choice and fit. Love it on you. Nice work. It looks great on you. Hope 2018 is a wonderful year for you and yours! Love it!! The fit is amazing! I have that pattern. Thank you for sharing how wonderful it looks. Did you have to make many pattern adjustments? Hi, great question. I should have mentioned in the post. I cut the bodice smaller and the pants larger. It is a common fitting issue for me though, to fit my bottom backside. Otherwise the finished measurements on the pattern paper were pretty accurate. Also since this fabric has stretch I knew I would have the movement I needed. If you were to make this with a non-stretch woven I would suggest maybe cutting up a size and working down the fit especially around the bust, waist, and hip area. Past the pockets the pants have plenty of volume, which I took a little of that out for me. Great fit, great color, great look on you! I haven't made a garment like this in years but after seeing yours I think I will give it a go! Thank you! It's such a great wardrobe piece! Wow! Thanks for sharing, after seeing it on you, I want to create it! Thanks, it was a really fun and relatively easy/quick item to make!